Winter Meetings in Vancouver - Know Before You Go! 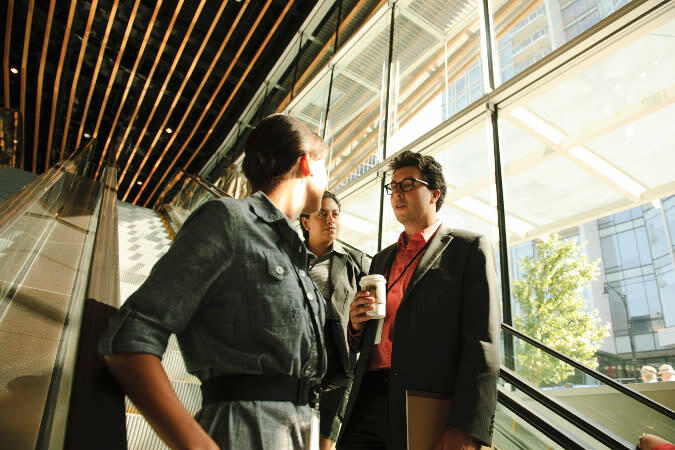 If you’re attending a meeting in Vancouver this winter, you’re in for a treat! You’ll want to make sure that you allow a little time to see the city while you’re here, but even if you have a two-hour break between sessions, we’re here to help you make the most of your time in the destination. There’s snow on the mountains (but rarely on our city streets! ), festive celebrations, and plenty of delicious delicacies to sample. Don’t forget that most US and international cell phone and data plans don’t automatically cover Canada. To avoid roaming charges, purchase a Canadian data roaming and calling plan from your provider, or plan on switching to wifi only and connecting with your friends and colleagues via email, WhatsApp or Facebook. 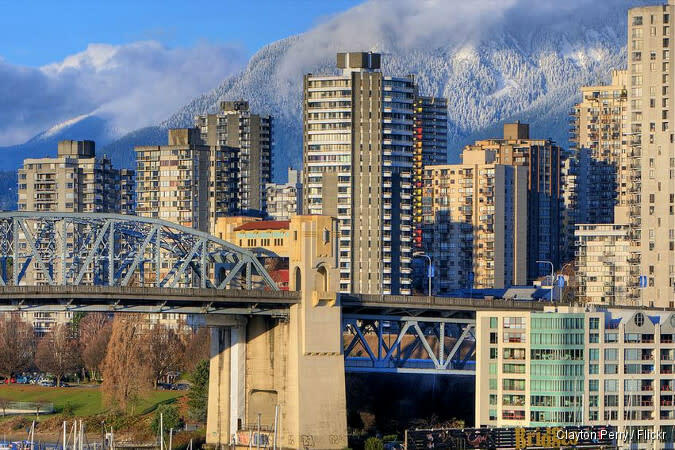 Temperatures in Vancouver over the winter months of December, January and February are relatively mild (at least, by Canadian standards), and while there’s a good chance you’ll encounter rain, snow is a rare sighting in the city. Temperatures hover between 5˚C – 10˚C (40˚F – 50˚F) during the day, dipping a further 5˚C (10˚F) overnight. If you’re heading up to Vancouver’s local mountains, expect snowy conditions and the temperature to be colder than downtown. Check Vancouver’s current and historical weather conditions online here. Because the temperature is quite mild, it’s best to dress in light layers, so you can easily adjust for a sunny day. Make sure to pack a rain jacket and an umbrella. If you’re thinking about heading up to the local mountains, make sure you bring warmer layers (or your ski gear) as well as gloves, scarf and a hat. Bring some good walking shoes – Vancouver is a great place to explore on foot! You’ll most likely be flying into Vancouver International Airport, and you’ll find that the easiest way to get to downtown is by hopping on the Canada Line light-rail service – just look for the “Trains to the City” signs. The 30-minute trip is CAD $9, and tickets can be purchased by credit card on the platform. 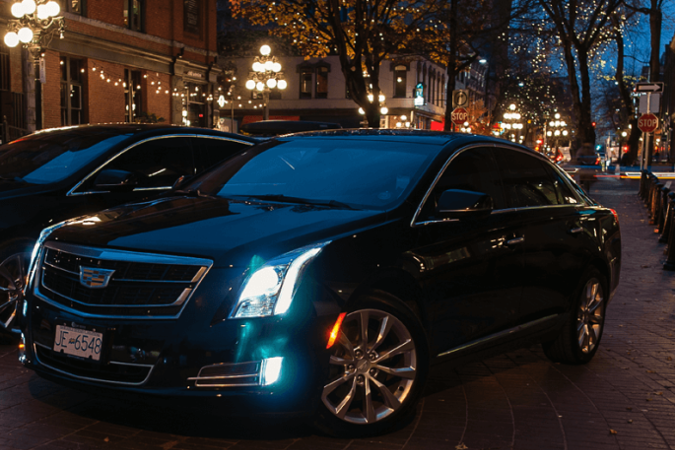 Alternatively, taxis are available and charge a flat fee from $31 - $35 for downtown zones. Once you’re downtown, walking is often the best option in our compact, very walkable city, even in the middle of winter. 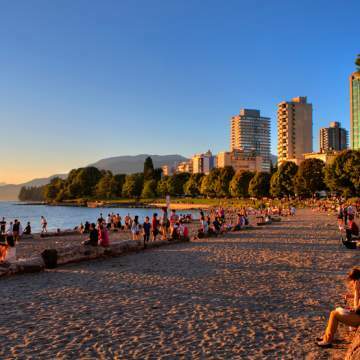 Most hotels are within a 10-minute stroll of the Vancouver Convention Centre, and you can easily walk to many downtown attractions including those in Gastown, Stanley Park and Robson Street. Just ask your concierge for a map. Your delegate badge comes with perks! When you’re out exploring the city, shopping and dining, remember to bring it with you to enjoy exclusive discounts and offers. You’ll save on admission to some of our top attractions, enjoy special offers at some of our favourite restaurants, as well as savings at spas, boutiques and on tours. See a list of offers here. 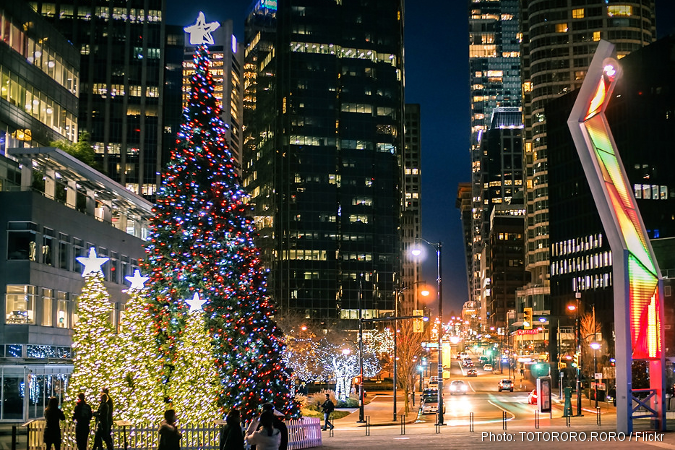 If you’re heading to Vancouver in December, it’s a fantastic place to indulge in the holiday season. 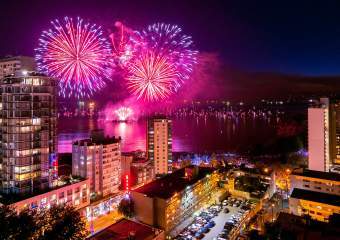 The city is decorated with millions of twinkling lights (like those at Capilano Suspension Bridge and VanDusen Botanical Garden), the Vancouver Christmas Market sets up right next to the Vancouver Convention Centre, and you can even take an “Elfie Selfie” up at Grouse Mountain’s “Peak of Christmas” celebration. There’s lots to see on the stage during winter! Catch Motown at the Queen Elizabeth Theatre, or Arts Club Theatre Company’s Misery or Onegin. TheatreSports on Granville Island let’s you watch two teams of performers pitted against each other in competitive improv matches. If you’re looking to add some rhythm to your Vancouver visit, the city’s music scene is at the ready. Jazz lovers should head to Frankie’s where they’ll find live music four nights per week. Looking for something heavier? Check out listings for the Commodore Ballroom and the Orpheum. Vancouver’s winter festival schedule runs the gamut, from holiday celebrations and the Winter Solstice Lantern Festival, through to the multidisciplinary PuSh International Performing Arts Festival, and the JFL Northwest comedy festival, as well as Lunar New Year festivities celebrated among Vancouver’s sizeable Asian community. Watching sport in winter comes down to one thing: hockey! Check out the NHL’s Vancouver Canucks, playing at downtown’s Rogers Arena. If you’re not able to score tickets, the next best thing is to catch a game on the big screen, surrounded by local diehard fans. Try the Shark Club, The Charles Bar or The Blackbird. For a full calendar of events as well as purchasing tickets, head over to Tickets Tonight. Or stop by their booth in the Tourism Vancouver Visitor Centre for day-of, half-price tickets! 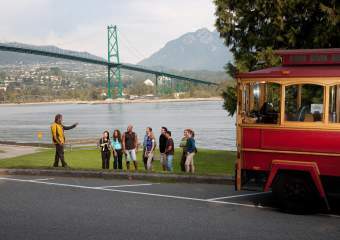 Even with a couple of hours of free time during your stay, you’ll have plenty of time to get an authentic Vancouver experience. Grab a False Creek Ferries mini-tugboat over False Creek to Granville Island. The spot is famous for its public market, but you’ll also find plenty of tempting cafes, artisan studios and other souvenir-worthy diversions. 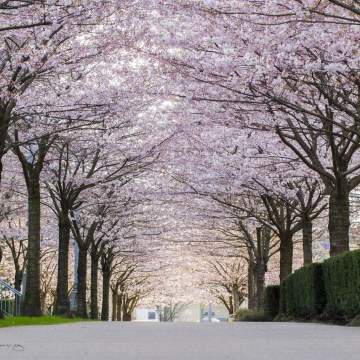 And while it might not be the ideal time of year to stroll Stanley Park, make sure that you at least take a drive around the perimeter or board a hop-on, hop-off bus to catch a glimpse of this huge, green space right downtown. Most of Vancouver’s attractions are open year round, but there are some spots that top our list during winter. Just 25 minutes from downtown, Grouse Mountain offers more than just skiing and snowboarding. Along with the impressive views from the Eye of the Wind, check-out skating, light walks, and the Snowshoe Fondue tour. Known for its marine stewardship and research programs, Vancouver Aquarium in Stanley Park is also a great choice for a rainy day, as is the 4D movie experience, FlyOver Canada. Organized sightseeing tours can be a great way to take in as much as possible in a limited amount of time. Hop-on, hop-off buses such as Westcoast Sightseeing’s tours have stops at most of Vancouver’s top attractions, and you get some entertaining commentary on your way. 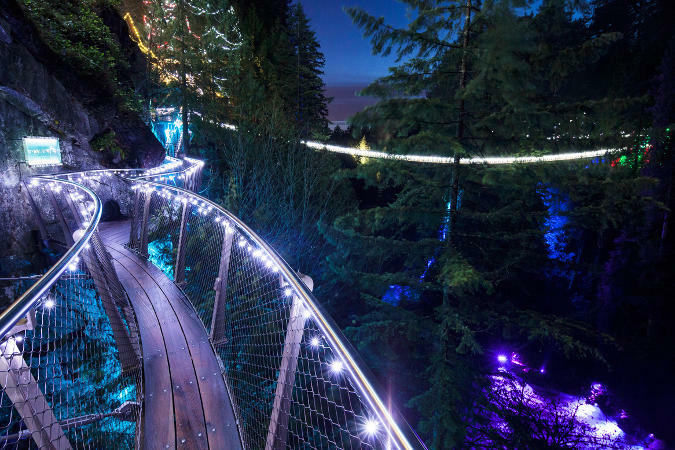 Tours offered during winter include Landsea Tours’ Vancouver Delights excursion which downtown highlights before heading over the bridge to the North Shore and exploring Capilano canyon. Or explore the multitude of customizable private tours offered by ToursByLocals. The city’s galleries range from the acclaimed Vancouver Art Gallery right on Robson, through to smaller, independent spaces such as Coastal Peoples Fine Arts Gallery and Uno Langmann, where you can pick up museum-quality pieces to take home. Delve into the region’s First Nations culture with a visit to the Bill Reid Gallery of Northwest Coast Art or the Museum of Anthropology at UBC. Whether you need to pick up souvenirs for those at home, or treat yourself to something special, Vancouver’s shopping scene will not disappoint. Downtown shopping is centred around Robson Street, with Pacific Centre mall (home to both Holt Renfrew and Nordstrom department stores) anchoring one end. Stroll nearby neighbourhoods like Yaletown and Gastown for independent boutiques and shops, or hit McArthurGlen Designer Outlet (just two train stops from the airport) to fill your suitcase with deals. 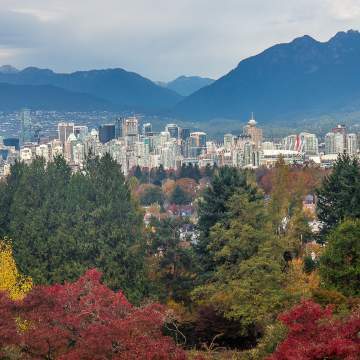 Vancouver makes a great starting point for exploring British Columbia. So you might want to extend your stay by a couple of days to see more of our province. The world-class ski resort of Whistler is just two hours from downtown Vancouver, and even if you don’t ski, attractions like the Peak2Peak gondola linking the two mountains and the lively, walkable village make it worth a visit. The province’s capital city, Victoria makes a charming day trip, especially if accessed via a scenic 35-minute float plane ride. Vancouver is a city that is very passionate about what’s on its plate and in its glass. From fresh West Coast seafood (look for the sustainable Ocean Wise symbol on menus), through to seasonal delicacies, and fusion cuisine that represents the multi-cultural diversity of our city. 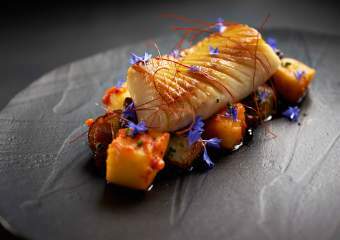 Critics say we have some of the best Asian food in the world, but you’ll find that our chefs have put their own stamp on it, combining local ingredients (like Pacific salmon, foraged mushrooms and berries) with traditional techniques. Here our restaurant picks for your winter visit to Vancouver, all downtown and most within a 10-minute walk of the Vancouver Convention Centre. 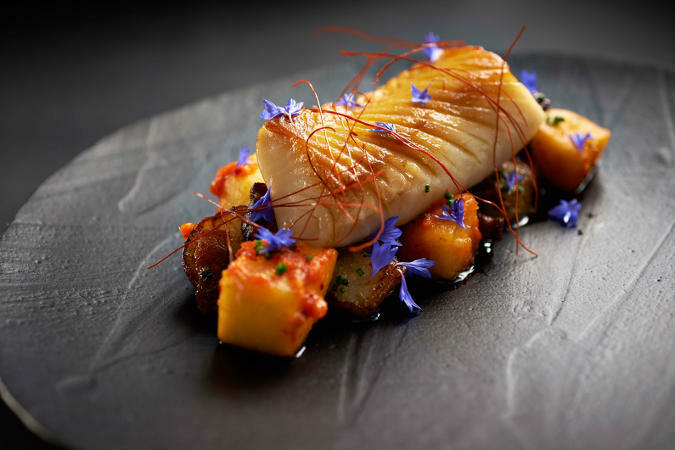 Hawksworth Restaurant: Arguably Vancouver’s best restaurant, and perfect for a splurge. Chewie’s Steam & Oyster Bar: Winter is a great time to indulge in local oysters! Hapa Izakaya: Relaxed Japanese food in an impressive room, right by Canada Place. Royal Dinette: Best spot in the city for refined bistro fare with a local twist. The Blackbird Public House: 48 beers on tap, plus a huge selection of Scotch whisky. ARC: A light-filled space in the Fairmont Waterfront, for celebratory bites or cocktails. Black + Blue: A contemporary steakhouse with a welcoming rooftop patio. Butcher & Bullock: Casual bites, local beers and a great place to catch the game. Cafe Medina: Vancouver’s favourite spot for breakfast and brunch – worth the line-up! Pink Elephant: A modern twist of Thai food. 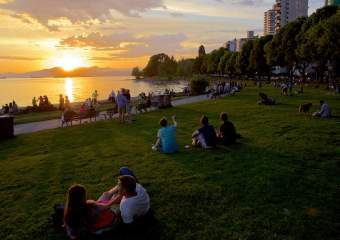 Whether you’re a wine lover, cocktail hound or beer fan, you’ll never find yourself thirsty in Vancouver! British Columbia produces its own wine, and you’ll find it on the menu at most local restaurants. 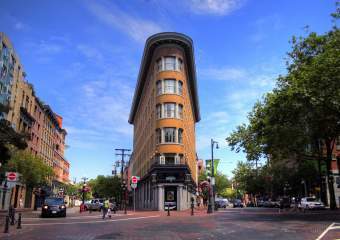 The city also boasts a thriving craft brewing scene–Gastown’s Steamworks Brewing Company, Railtown’s The Belgard Kitchen and Mount Pleasant’s Big Rock Urban Brewery are all great places to sample the local wares. Cocktail bars such as Clough Club, The Cascade Room and UVA often use spirits from Vancouver’s own distilleries, putting a local twist on your G&T, gimlet or greyhound. If you’re interested in exploring the culinary scene outside of the bar or restaurant, consider signing up for a tour! Crawl the city’s beer scene with Vancouver Brewery Tours, a tour of a tasty neighbourhood on foot with Off the Eaten Track, or taste your way around Granville Island Public Market with Vancouver Foodie Tours. If you’re lucky enough to be visiting the city between at the end of January, don’t miss the annual Dine Out Vancouver Festival. Hundreds of restaurants offer menus at $20, $30 and $40 price points, but that’s just the beginning. Events include tasting tours, masterclasses, family dinners and international chef collaborations. Or if wine is more your focus, the Vancouver International Wine Festival (mid-February) is one of the world’s largest consumer celebrations of vino, showcasing bottles from over 175 wineries from around the world.